Are you looking to set up a website for your mosque? All kinds of information related to Islamic practices can be conveyed through a WordPress website with an Islamic theme. Using WordPress to design your website can save you a great deal of money and time. Islamic themes are increasingly making a comeback on the digital spectrum. 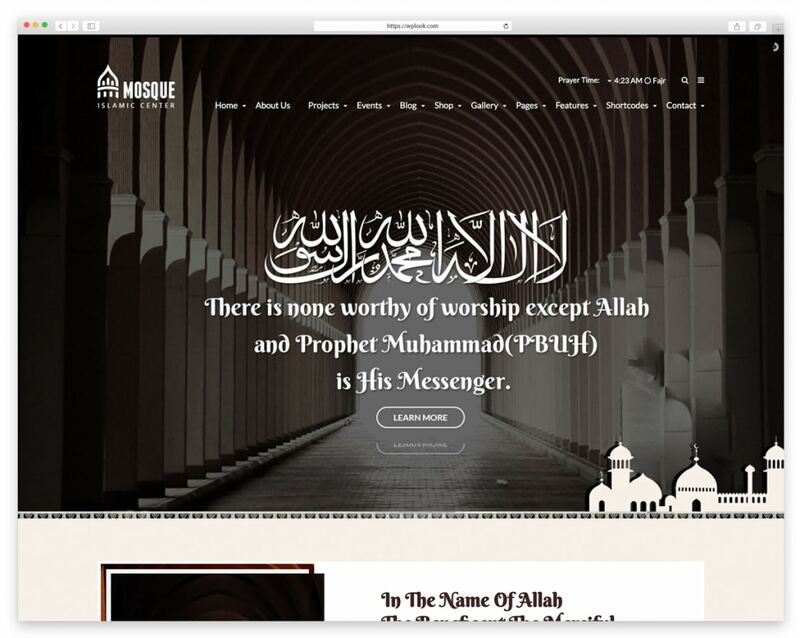 These themes allow you to create professional, engaging, stylish and inviting website for your mosque. They have a similar layout as their English counterparts except for their built-in support to display other languages and specific needs targeted towards the millions of Muslims all over the world. The right mosque theme will help you create that great look that will make more visitors want to visit your site and be part of your audience. With customizable theme settings and plugins like e-commerce integration, you can turn your Islamic Website into an online store where you can sell merchandise related to your Faith like audiobooks and CDs. If you choose to include an online store, make sure you integrate a trusted payment gateway to secure your transactions. This post has curated 10+ Top Mosque and Islamic WordPress themes with all the features that an Islamic website should possess. Let’s have a look at each of them. 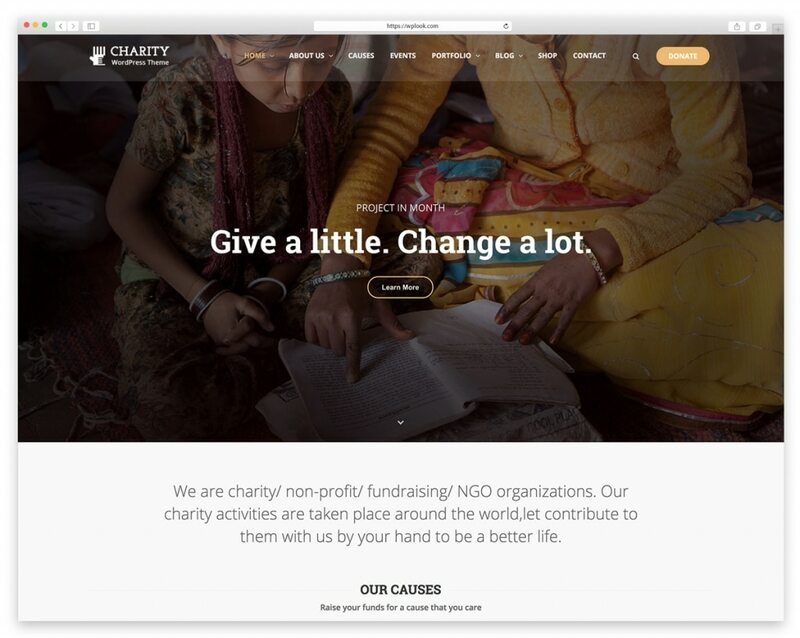 Charity is a modern, fast-loading, flexible and purposeful Islamic website building tool that has incredible features and enhanced communication options. It will help you create a stable and responsive website that will stand out from the crowd. So what makes Charity great? The theme is integrated with PayPal and Stripe, the perfect fundraising tool for collecting donations. You can easily include all the social media icons, necessary links, logo, slogans and any other content you think is relevant to capture your visitors’ attention. You can play around with the color schemes with the visual editor to come up with an interesting and unique design for your site. This theme works well on all screen devices, sizes, and social media sharing widgets helpful in engaging your followers. With Charity theme, you can publish books, newsletters, flyers and annual reports in a stylish format. You should just choose your package: Standard, Developer or Club Member and start to create the website you dreamed about! 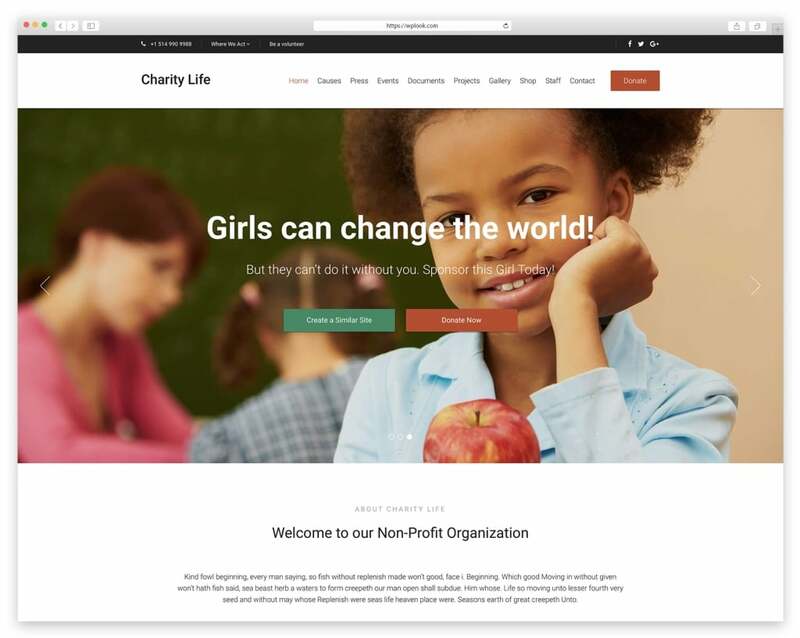 Charity Life is another simple and affordable fundraising WordPress theme by WPlook Themes. This creative and powerful WordPress theme comes with several elements to fulfill your needs. With high-quality image and video support, you can share content like sermons and recent events in a visually pleasing, calm manner. This theme manages to balance beauty and power. Raising funds for your cause is now possible thanks to PayPal integration. Whether your plan is to make your Muslim community united or motivate more members to participate in donation programs, Charity Life has got you covered. Make use of the Advanced Theme Layout Options to get seamless performance and usability. A great feature that Charity Life has is that you can turn your Islamic website into an online store through WooCommerce. Also, the theme allows you to spice up your website with dynamic elements without worrying about the source code. This elegant, customizable and totally shareable theme allows extensive room for modifications. 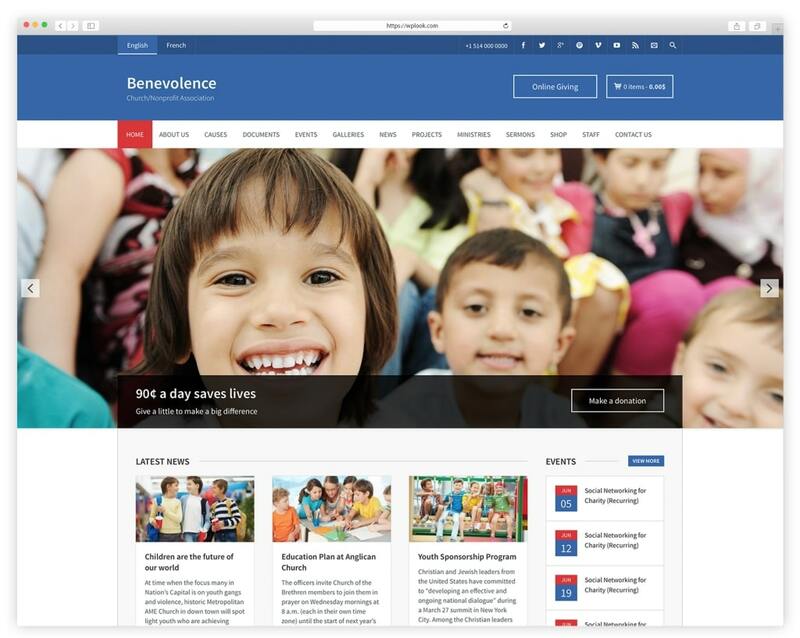 Packed with handy features and tons of customization options, creating an outstanding site with Benevolence is now possible. Benevolence comes with donations plugins to provide trustworthy payment gateways. 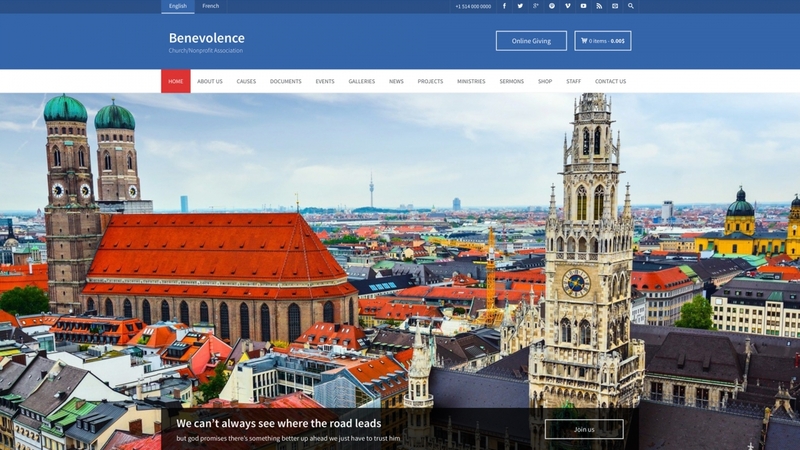 Armed with Benevolence’s many smart features, updating your site with current news, contact details, colors, and topography will be fun. This theme includes many great features like 11 custom post types, child theme, online giving, Google calendar and unlimited color schemes. The powerful customization options will allow you to get creative with the background and colors. With subtle colors, you are assured to impress your members and visitors and keep them coming back. The thoughtful design ideally fits on any resolution and looks appealing on all devices. The theme is extremely fast and the WPlook team offers top-notch support. An attractive event system in your Islamic WordPress website is a major talking point to your followers. Charitas is the perfect Arabic theme is you are looking to represent Arabic content to your followers in a well-organized and friendly way. 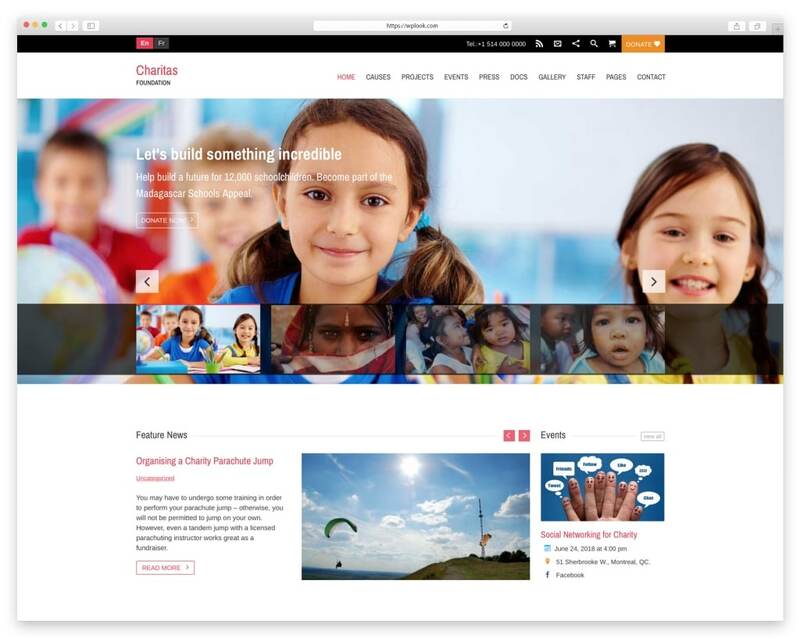 Charitas boasts 7 different Types of Posts and 18 Widget areas. Charitas is also SEO optimized and friendly to give you higher page rankings on SERPs. The theme includes event calendars, predefined color schemes and support for language translations. Charitas is impressively easy and intuitive for both customization and usage. It fits perfectly on different displays and resolutions. This WordPress Theme is indeed a great tool in the arsenal of a professional website designer tasked with the noble responsibility of providing an online presence for the Islamic community. The theme is integrated with PayPal and Stripe, the great fundraising tool for collecting donations. Check this amazing theme form the list of best Islamic Themes and create the website you want! Mosque is yet another creative, RTL-ready and ultra-responsive nonprofit website theme loved by web designers due to its ease of use when creating an Islamic website. Some of the standout features include Audio and Video Management, Event Management, Prayer timing, Islamic Teachings Management, PayPal Donations, Arabic Fonts, Crowdfunding and WooCommerce Integration. The theme is compatible with all the major browsers and the knowledgeable and friendly support will answer any question you might have regarding Mosque. The regular license goes for $59.99. Peace is an advanced, visually inspiring, translation ready and responsive theme that will look good irrespective of the devices. Your preferred design and images will be fully responsive to be viewed effectively even on hand-held devices. Peace has an intuitive interface that makes it easy to understand even if you have zero coding experience. Choose from 600+ Google fonts to customize your site to your liking. The 3 Home Page variations and powerful blog features will enable you to update your website with fresh content which in turn will improve your search engine rankings. WooCommerce integration will allow you to set up an online store. 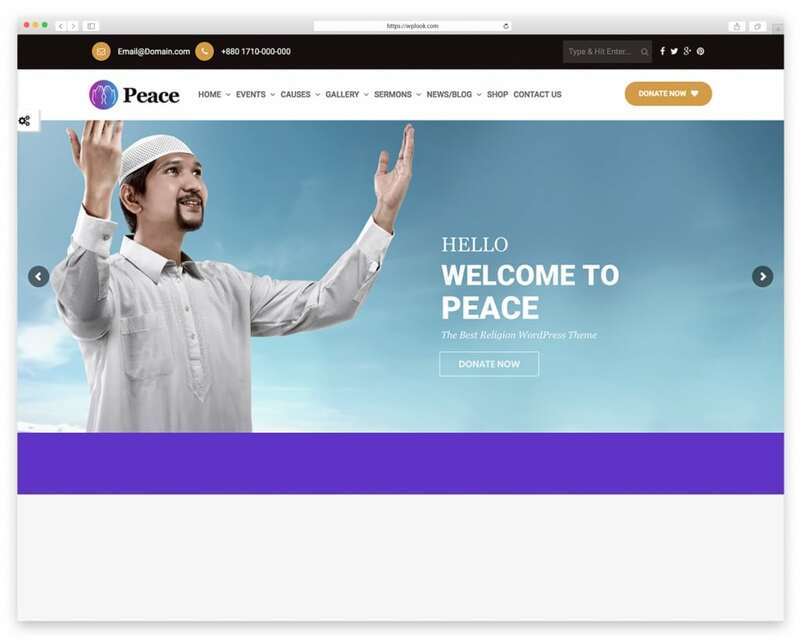 If you have been unsuccessfully searching for the right theme to spread the popularity of your mosque, look no further than Peace, a great theme among the top Islamic Themes. Islamic Center was designed with Islam in mind. 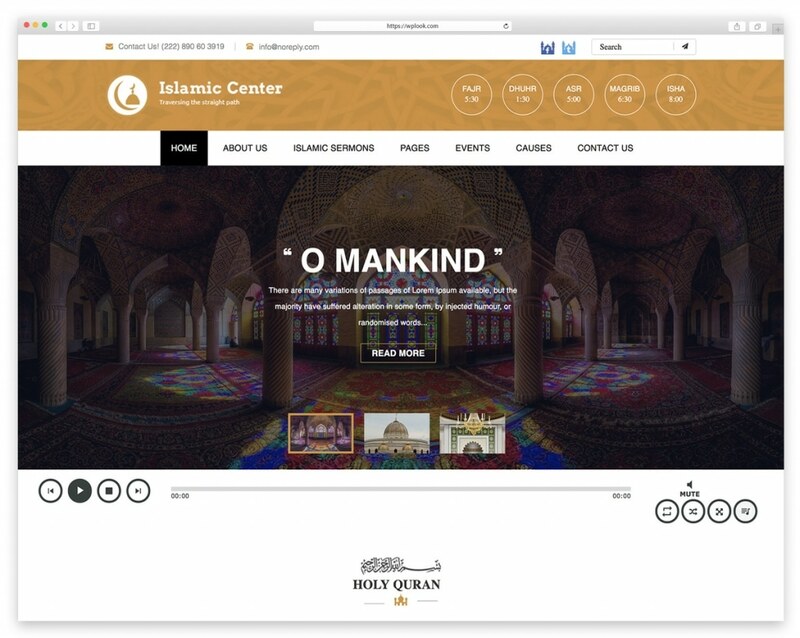 There are several religious website themes out there, but Islamic center is superior with high-end features unique to Islamic culture. It is the perfect theme for adding audio and video content, managing events in the Islamic calendar, collecting donations and listing profiles. You will love the commenting system, admin panel and drop-down menu in Islamic Center. The drop-down menu enhances interactivity to the overall bold and professional design of the theme. Islamic Center formats itself responsively for hand-held devices. It also features built-in infinite scrolling for blog use, adding more depth and interactivity to the design. The theme has secure payments using Stripe, PayPal and Authorize Payment Gateways. Make use of the drag and drop page builder to tweak the functionality of your Islamic website. With Google Maps and Social media integration, it will be easier to connect with your members. Due to its great features, Islamic Center has its place in our list of Best Islamic Themes. Charity is a visually and functionally excellent theme with an awe-inspiring layout. The widget-ready theme lets you create, configure and run a mosque or Islamic community website as per your need without touching code. This responsive SEO-friendly theme will help to provide your Islamic site with a sleek look tailored towards Arabic. The easy to use admin panel and professional layout will help you create a responsive website. Add a shop feature with WooCommerce and pick up any from the 700+ Google Fonts library to showcase your mosque. You will enjoy the mail subscription functionality, events calendar, and video support. 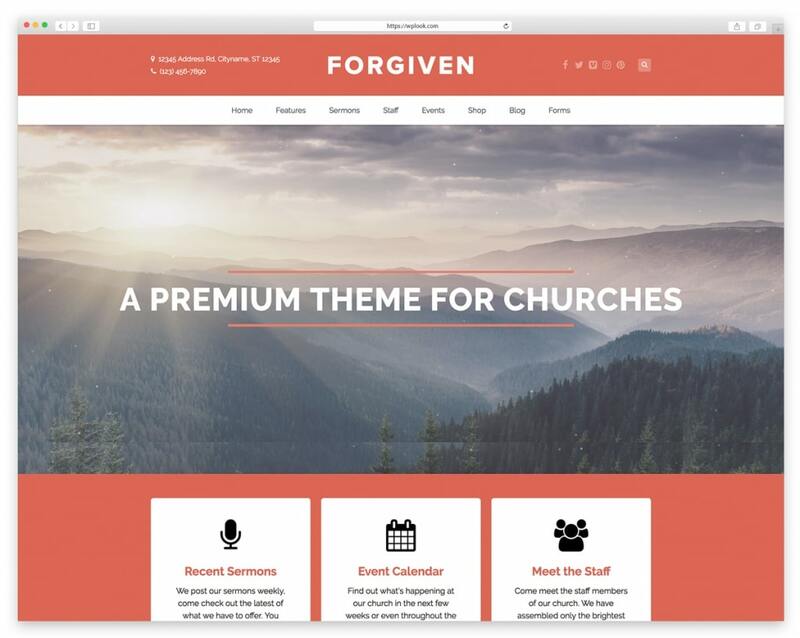 Forgiven is a clean, feature-rich and modern-looking theme with everything you need to set up a website for your mosque. Forgiven is fully customizable and has the right blend of durable function and aesthetic form that will empower you to connect different individuals to your Muslim community. You also get vital functionality for the mosque, pre-built page layout, event management and time schedule. For editing, Forgiven provides you with a straightforward admin panel. To get a regular license, you will have to dish out just $39. Forgiven has its deserved place in the top best Islamic themes. 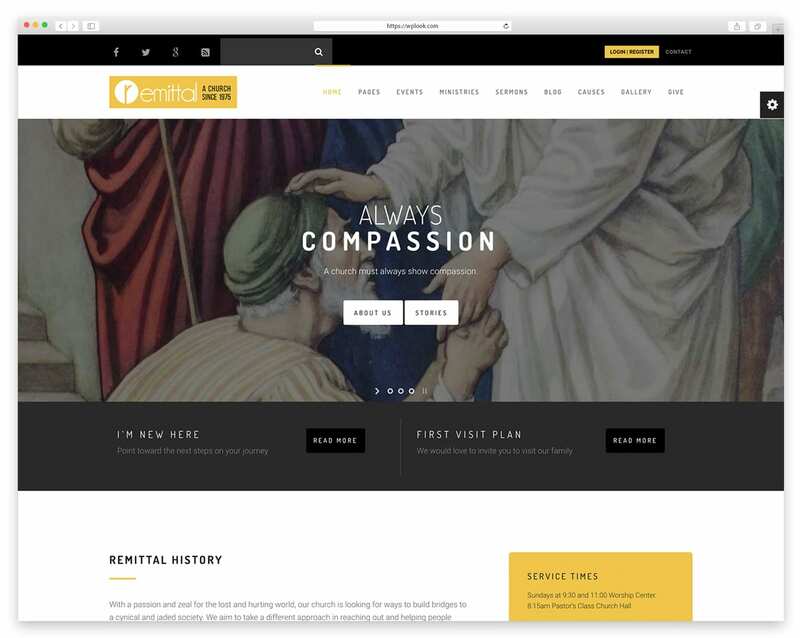 Church Suite is a resourceful and Retina-Ready theme popular for its clean and minimal design. This Theme from our best Islamic Themes was designed for Muslim community representatives looking to create the best user experience and readability through their posted content. Your web visitors will enjoy the fast loading times. Some of the outstanding features of Church Suite are custom social media widgets, management features for donations, events, and causes, several layouts, and color schemes, etc. Islamic and Muslim client market is growing at a fast pace. Many Islamic themes come out every year trying to address Muslim-specific needs like charity requests, religious events, and Muslim related news. With any of the 10+ Islamic themes above, you will be able to fulfill your website requirements and wishes. Pick one that goes better with the overall design of your Islamic website.